Happy Birthday to all October Babies! Family and Friends have always been close to My Heart and Mind. 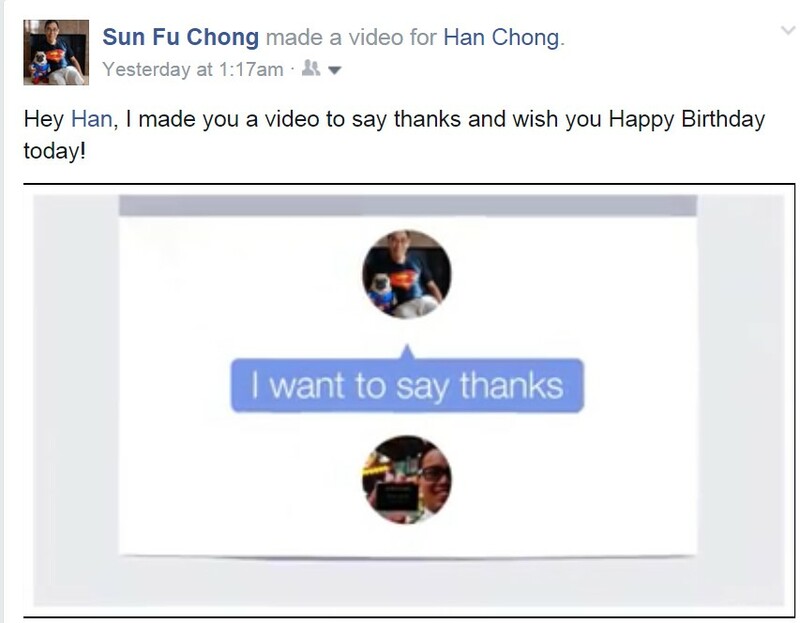 On the month of October we tend to celebrate the birthdays of our family with Su Min on 4th October, Dad on 5th October and Woon Han on 19th October closely with each personally if they are present at home and/or an online celebration so that others away can join in or if they are away from home themselves. Our friends of the family in Church include - Katherine Orgill and Anthony Liew on 2nd Oct, Kevin Tham on 4th Oct, Vanessa Wong, Bro Selvaragu, Judy Beard who served a mission with her husband Colin in JB from Australia and Ariunbolor whom we met in the HK temple from Mongolia on 6th Oct, Andrea Davis Pyle on 9th Oct, Kent Davis on 10th Oct, Jenny Han and Mackenzie Walker on 13th Oct, Gunchi Takeyama on 14th Oct, Merille Yong(Sheppard) on 15th Oct, Dennis E. Dalling and Duncan Horne on 16th Oct, Deedra Rama on 17th Oct, Penny Low on 20th Oct, Richard Ho, Wu Yuk Choi and Samantha Ng Li San on 21st Oct, Jeffrey Lim on 22nd Oct, Sarah Brandt, John Lee and Helen Loong on 23rd Oct, Charlene Goo, Julie Lanshe and Terrence Lim on 25th Oct, Rachel Tan on 27th Oct, Mariann Selvaragu and Steve Tettey on 29th Oct.
Mimi Ho Lian Sim, my only sister-in-law with the same Libra star and wisdom that I knew from growing up with her guidance that persist to this day. Birthday stories from 2014 here. Even my son Shuan gets wisdom from her to this day, one representing the Next Generation. 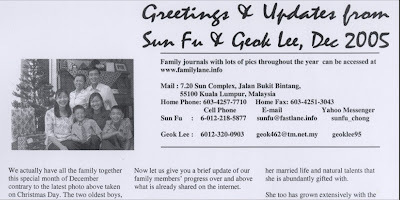 Su's birthday on Oct 4th and mine on the 5th are often celebrated together as her US time can be the same day as Dad's Msian/Spore time on an online get together as shared in a special post here. 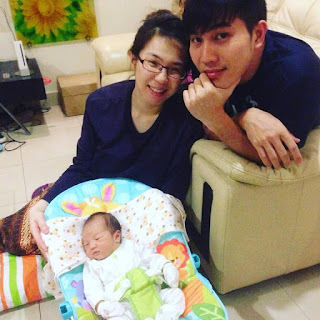 On the 4th of October is also the birthday of my nephew Yang Arif Lim Chong Fong who was my playmate in our younger days as I was the youngest of a family of 7 and he the oldest of 4 to create only a small age difference between us to make us good buddies. Only problem I guess is when we all grow up, we become busy with our own life, work & family particularly and glad there were some larger family events that we could catch up with each other. I have the privilege of sharing their first family photo here in this auspicious month and my first view of Chong Rui Yang! 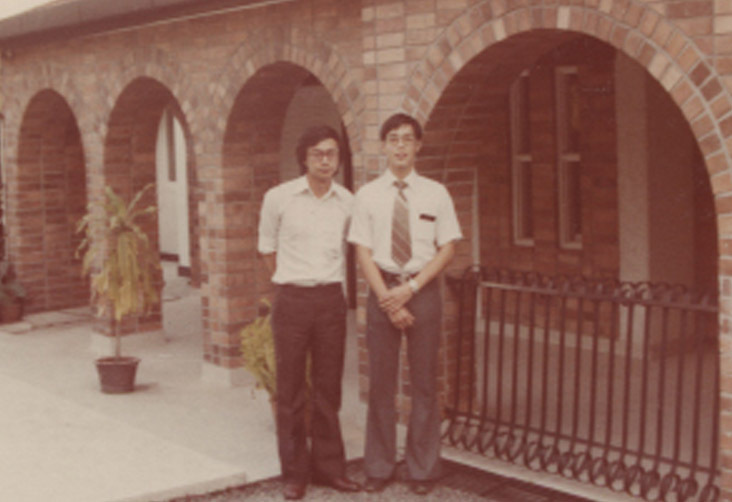 Besides family, there are some friends who also go back a long way in time like to the single school days such as Lim Sim Seng whose birthday is on this day. 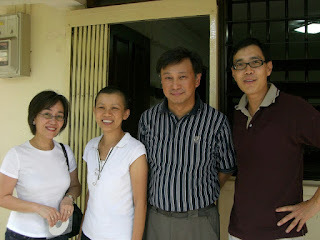 ... years later when he learnt that my wife Geok Lee had cancer, he came to visit us in our Singapore home too! This is the birthday of the oldest boy of the family on the far right carrying his Dad with his siblings! 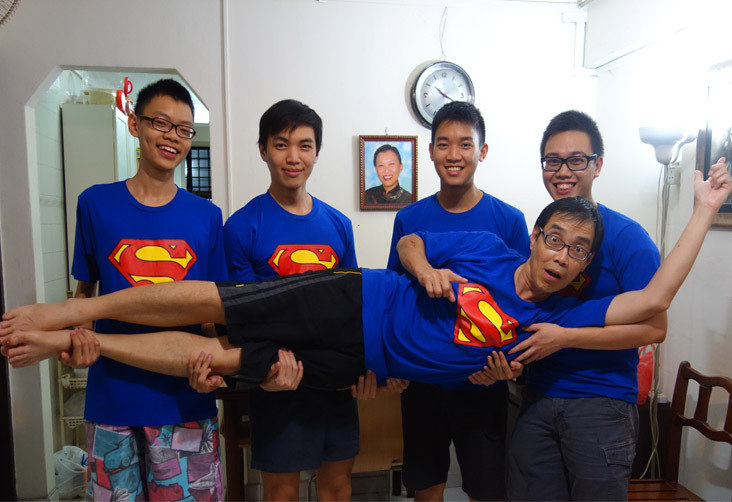 If his Dad loves to play Superman, then surely he hopes his boys will be Super too and the oldest son Han Chong or Chong Woon Han is paving the way. The problem is he is setting such a high standard recorded in his personal profile found in familylane that it will be hard for others to emulate! But not to worry as his Dad is fine even if they end up making 'Super Goof Ups' like he did to create a facebook video for his birthday to post on his timeline a day too early!!! 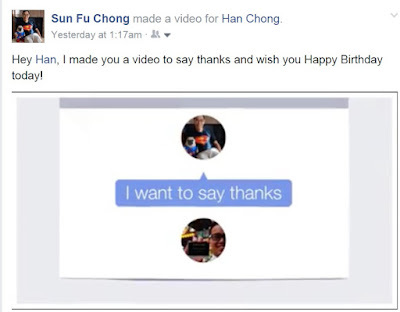 Here is on the night of the actual day of his birthday where everyone in the family got online on Google+ Hang out, except Ern who could only call in on the phone from his army camp, with Shuan in Kuantan and the girls in US, to chat and sing Happy Birthday to Han before he blew the candles and cut his ice cream cake that was starting to melt! Mom of course looked on in spirit of our ongoing family gathering on birthdays and other special occasions in the Singapore home. Wu Yuk Choi celebrates his birthday on this day! 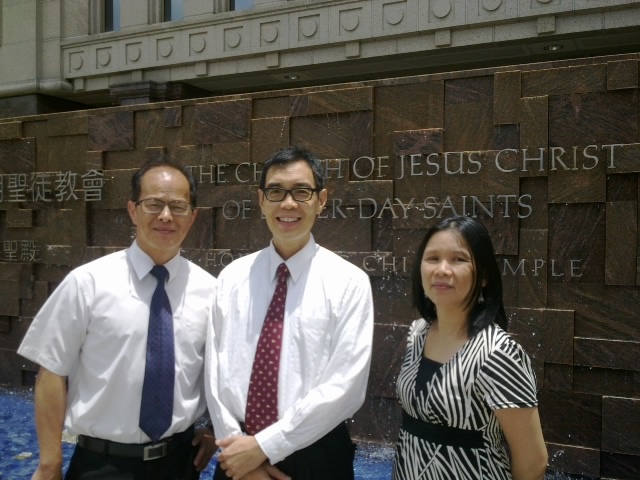 ... and reunite again in May 2012 in Hong Kong when we were there to accompany our oldest son Han to the temple before his mission to the Manchester UK. Look forward to meet him again next month when he will spend time with me to visit mainland China to help me find my ancestral home village in Meixian. 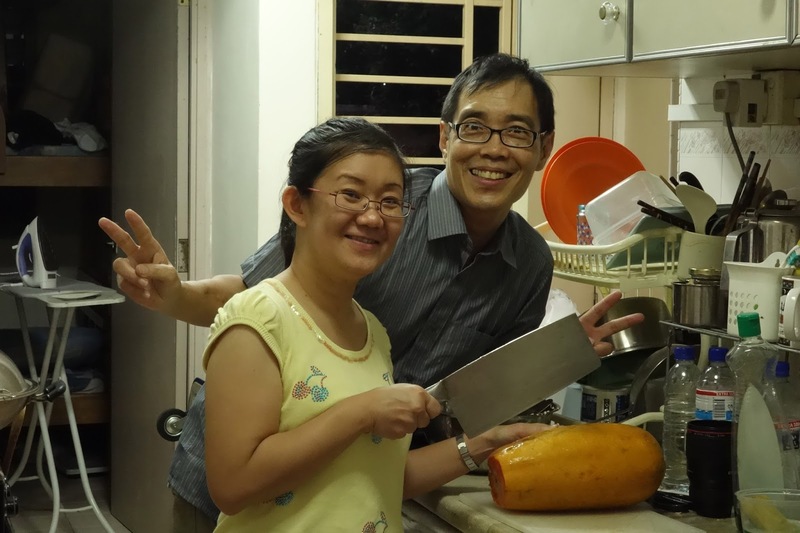 It's Happy Birthday to Ng Li San, a member of Melaka Church who visited our Spore 'Boy's camp' home in Singapore to help in the kitchen where the above photo was taken in 2014! Meanwhile it's all quiet at home with just Ray the youngest and his Dad! 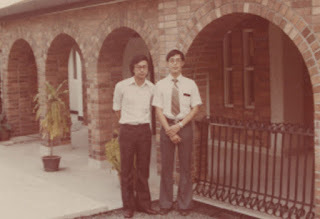 Oldest brother Han lives at the Yale-NUS campus, the 2nd brother Shuan is having driving lessons in Kuantan and 3rd brother Ern has to stay at his Specialist Cadet School as part of his National Service requirement. So the 'Like Father Like Son' team is seen busy at home even at meal times with their computer! Dad recalls the last time that there was just two of them alone together was in a 2011 Father-Son outing. It was very nice too because there were no computers in our tent! In fact he had another distraction out in the wild as shared here. This photo was taken on Ray's 17th Birthday last year on Sunday Nov 2, 2014 to see if he could beat his siblings to be taller than their Dad! We have to wait for Nov 2 next month to make this annual measurement on his birthday where comparisons started with photos since the year 2010 found in this post. A trial photo was taken on this day but as there was no 3rd person to take the photo, an auto self-timer camera was used which unfortunately chopped the top part of the heads to make it unclear who is taller in the auto photo shot! 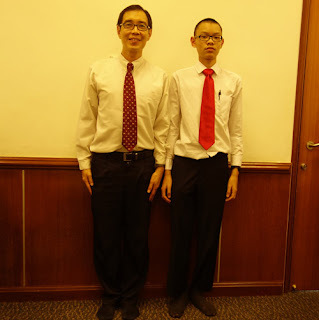 The suspense remains till the actual date of Nov 2, 2015 to have a judge present celebrating Ray's birthday to take another photo of us to record who is indeed the tallest in the Chong familylane journals on this date! This is the birthday of David Ooi, a neighborhood friend that I often visit when I am in Singapore. I was at his home on 22 Oct, a week before his birthday to catch up with the latest news from him on Singapore as I had to leave back to KL on 25 Oct for my China visa interview on the next day. he took the above photo of me with his iPad. I got him to take this front page of the day's paper of the news that the court had found the founder and 5 others to be guilty of all charges concerned with unlawfully taking money from their own Church in Singapore. We had first met in the Chinese New Year of 2013 and since then have become good friends. He has follow me on some trips to Malaysia. Happy birthday our strong man, Uncle David as the boys would call him, with wishes of continued health from our family!